When it comes to filmmaking, Rob McElhenney has it all. The versatile personality has worked his way to prominence as an actor, director, producer, and screenwriter. He is popularly known as one of the brains behind the FX/FXX comedy series, It’s Always Sunny in Philadelphia which he also starred in. Rob’s success story is indeed worth hearing by any aspiring entertainer. Here are lesser known facts about the talented actor. He was born on April 14, 1977, to his parents in Philadelphia. He is of Irish descent. The actor who is the eldest of three children was brought up in a Catholic family. When he was eight he witnessed the separation of his parents who opted for divorce after his mother came out as gay. After the divorce, Rob spent more time with his father who later remarried to another woman. He is an alumnus of Saint Joseph’s Preparatory School, Philadelphia where he started to live out his acting potentials. After high school, McElhenney proceeded to Fordham University although he never enrolled in any course. He rather spent time with friends on the school campus. Rob soon got a role in the 1997 movie The Devil’s Own. However, his roles were cut out at the final editing of the movie. He was also trying his luck with scriptwriting although his first attempts failed. At the time, McElhenney was also scouting for roles and opportunities in showbiz. After moving to Los Angeles at 22 he continued to scout for roles, was waiting tables and doing other odd jobs to sustain himself. It was during this time that Rob McElhenney met Glenn Howerton and Charlie Day. After pitching his idea for a sitcom to them, the elated two joined. All three of them starred in the sitcom and it was filmed on a $200 budget. Rob and his friends sought for cable networks that would accept the sitcom. After several scoutngs Rob accepted the offer from FX. Rob McElhenney then became the showrunner of It’s Always Sunny in Philadelphia while Glenn Howerton and Charlie Day became the executive producers. While producing the show, Rob appeared in the third season of Lost. He also appeared again in the sixth season. The talented personality was announced in 2015 as the director of the animation Minecraft. However, there were no follow-ups on the development. Rob played a guest role in the comedy crime series Fargo in 2017 on The Law of Non-Contradiction episode. The actor, producer, and director has remained relentless in his craft and looks forward to achieving a whole lot more in the industry. The talented television personality has garnered a whole lot in the course of his ever-blossoming career. 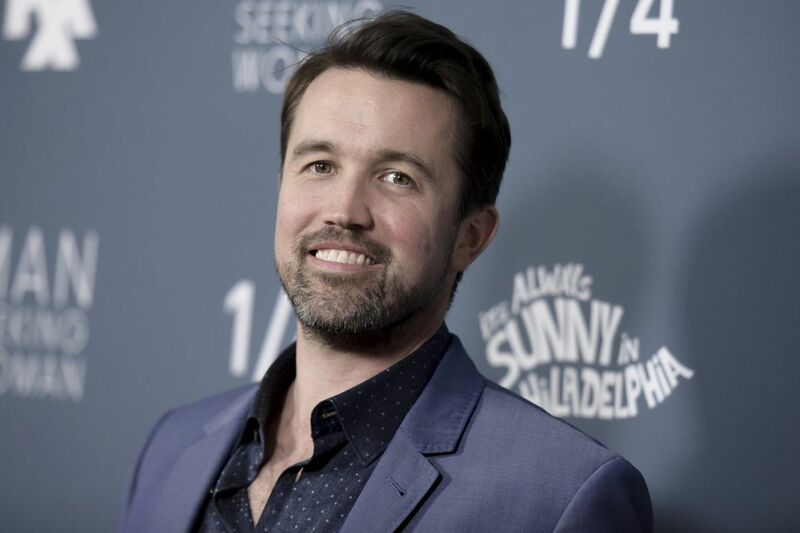 Rob McElhenney sits on a net worth estimated at a whopping $40 million and has his distinctive works to thank for it. As an actor, he has proved himself and as a director and producer, he has also shown great talent. Rob McElhenney is one of those celebrities with the on-screen kind of love story. When the producer employed actress Kaitlin Olson to play the character of Dee Reynolds in It’s Always Sunny, little did he know that she would end up becoming the mother of his children. McElhenney found Kaitlin Olson so interesting and funny and even described her as the funniest woman in showbiz. The two soon started a romantic relationship in the second season of the show. Things got more serious and the It’s Always Sunny parties got engaged in 2007 after Rob popped the question. They eventually tied the knot in September 2008. Two years after thy got married they welcomed their first son, Axel Lee McElhenney in 2010. In 2012 they had their second son Leo Gey McElhenney. In 2011, Rob McElhenney purposely gained 50 pounds weight in preparation for the seventh season of It’s Always Sunny in Philadelphia. He gained extra weight and also grew his beards so he could be made fun of on-screen. But after the filming was done Rob immediately embarked on a weight loss journey and burned the fats. McElhenney shared a room with Christopher Backus. He also went to the same high school with Donald McCloskey.